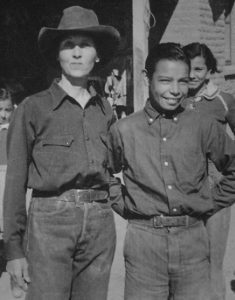 “Eulalia Bourne poses with Arturo Aros outside Baboquivari School in the 1930s. | Rosa Ronquillo Rhodes Collection, Postal History Foundation,” via Arizona Highways Magazine. On yet another trip down the rabbit hole yesterday, I encountered a lady who my friends in education would enjoy: Eulalia Bourne, 1895-1984, Arizona pioneer teacher. And she punched a few dogies (definition by the dearly departed Clay Thompson) in her day, too! Please read more about this enlightened educator at Arizona Highways.